* Fully plumbed filtration trailers with Air Tech to stand alone systems are available. * Flexibility to meet the site specifics on the fly while still maintaining necessary regulations. * Mobilize within the province to provide service for emergency situations usually within 2-24hrs. * Our equipment is constantly maintained, operated and certified as per Worksafe Regulations. * Additional equipment is available to respond to change of job scope (larger area, more crew, additional areas etc.). * We have backup monitoring systems and the ability to monitor remotely if required. * We have been successful in ensuring no down time with our equipment while on job sites; we pride ourselves in having our systems ready well in advance of the time requested or for any requested changes as needed. 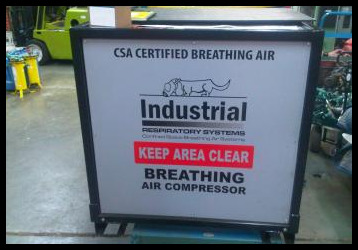 * To supply a safe and compliant, clean Breathing Air System for crews working in compromised air quality situations. * To deliver and set up in timely manner. * To support overall job by working with other trades in a cohesive cost effective manner.